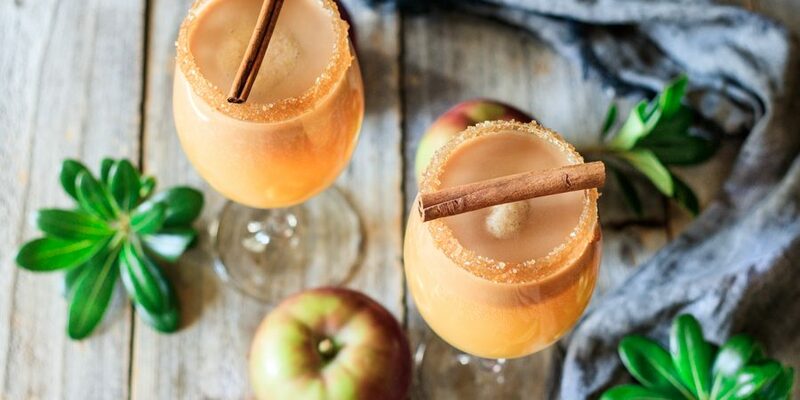 Looking for a drink to mark the seasonal transition from summer to fall? Caramel apple mocktail is not only a showstopping non alcoholic sweet treat, but it’s also quick to assemble. Soon, you can be chillin’ with your new favorite fall beverage! No, it’s more like a very strong ginger soda, but it’s shouldn’t be substituted with ginger ale. Ginger beer is made with ginger juice and ginger extract and has a strong ginger taste. It’s meant to be mixed with other ingredients to make it more palatable, but if you choose to drink it plain, it definitely packs a punch with its zippy zing. 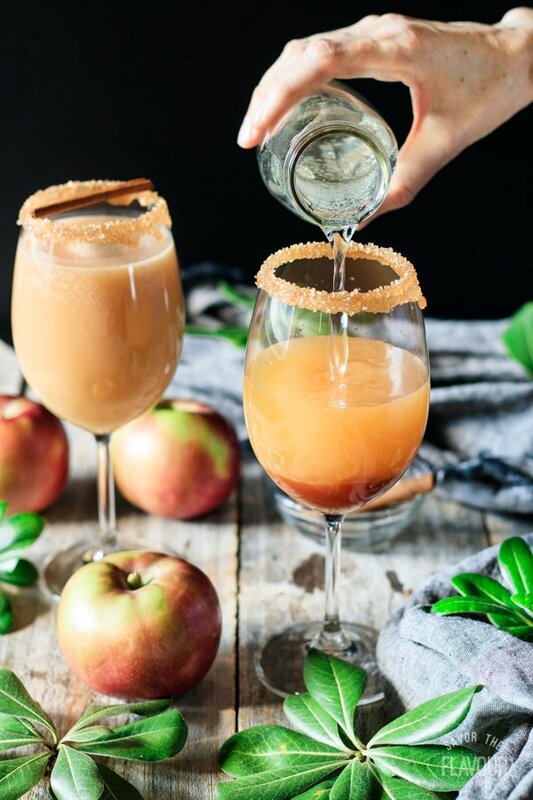 How should the glassware rim be decorated for this fall drink? 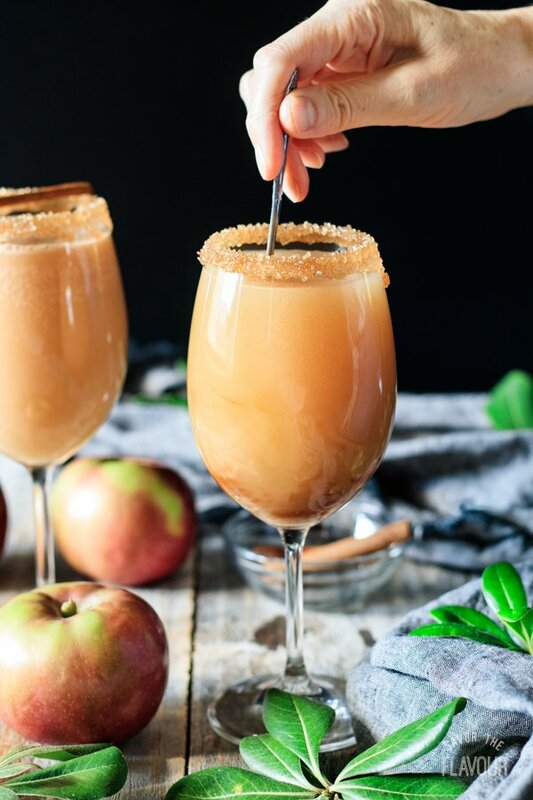 What kind of garnishes are popular for this fall drink? Can I make this ahead for a dinner party? 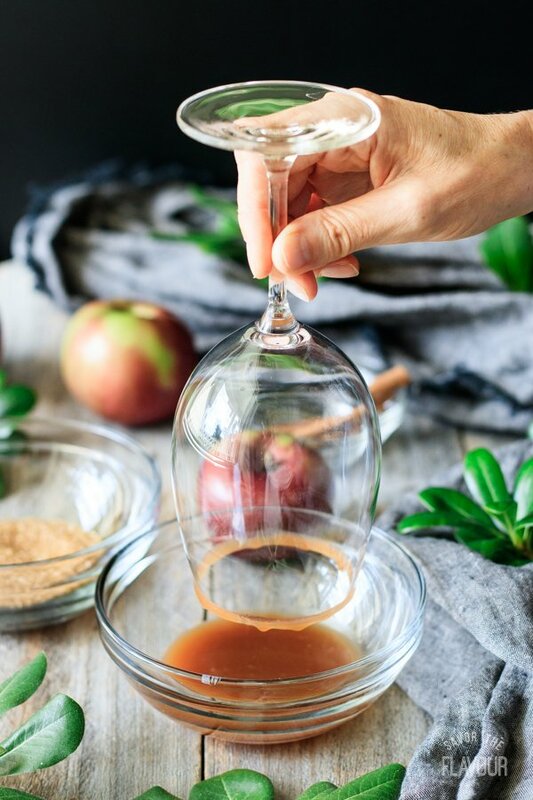 Yes–just remember to increase the ingredients because the recipe below is for one glass. The ratio for the caramel apple mocktail is 2:2:1. This means it’s equal parts apple cider and ginger beer with half as much homemade caramel sauce. Up to two days ahead, make the homemade caramel sauce. Let it cool, pour into a glass jar, and refrigerate. 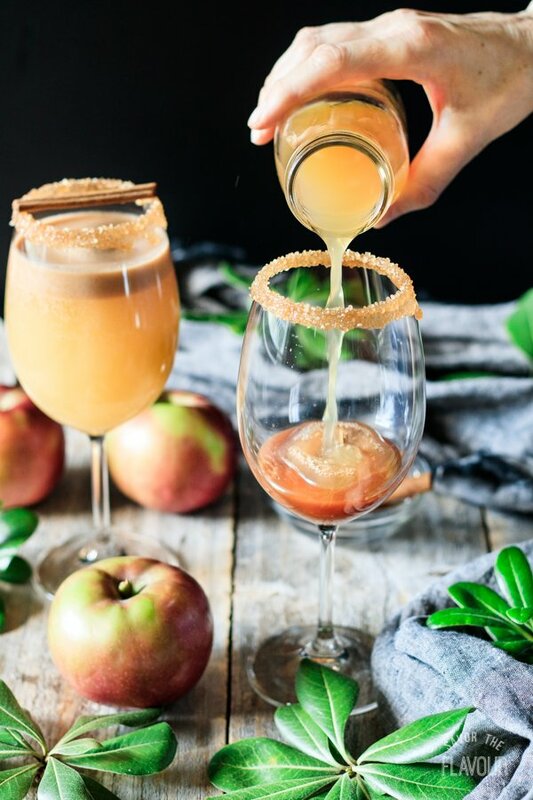 On the day of the party, decorate the rims of the glasses, and prepare the cinnamon stick garnish (one per glass). 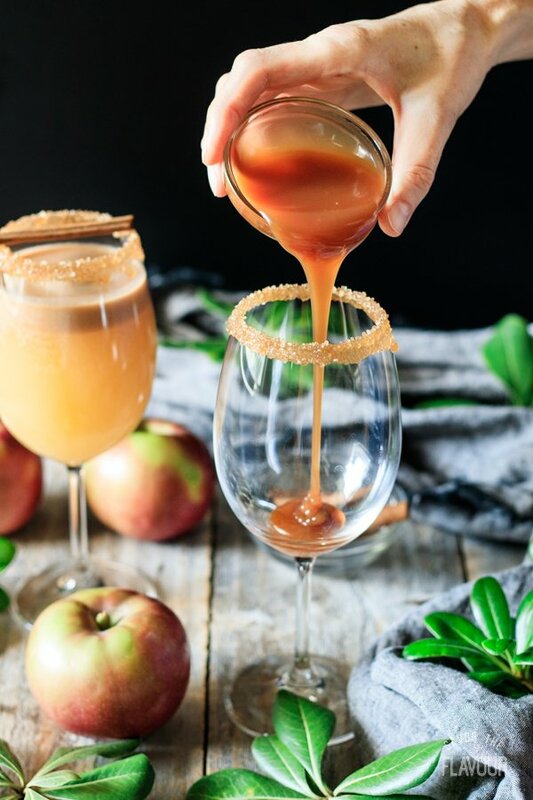 Warm up the caramel syrup in the microwave, then mix it with the cold apple cider in a glass pitcher. Stir until well combined, then refrigerate. Just before serving, stir the apple cider caramel mixture in case there was any settling. 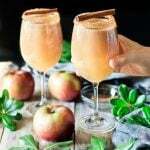 Pour the apple cider caramel mixture in each glass until half full, then top up with the sparkling ginger beer. 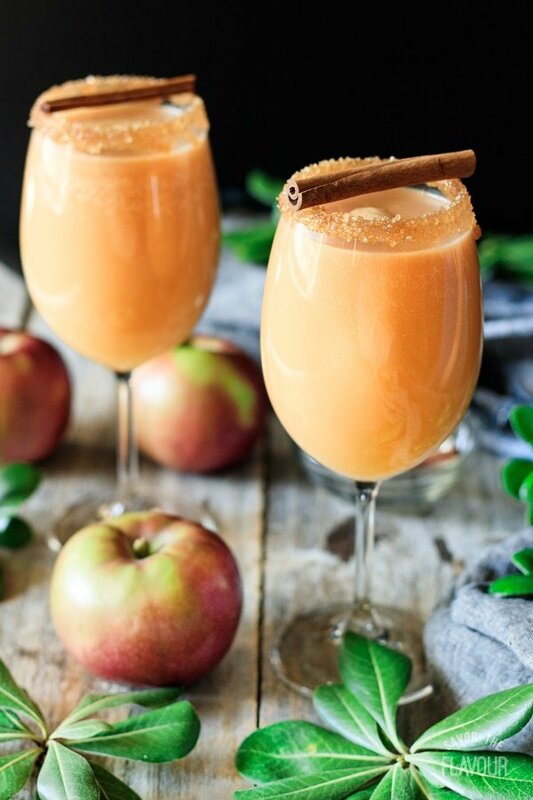 Stir each glass with a long-handled spoon and top with a cinnamon stick. How do you make a caramel apple mocktail? Start by making the homemade caramel sauce. (Click here to find out how.) Then measure out all your ingredients. Next, dip the rim of the glass in caramel sauce. Then take the plunge into the demerara sugar. 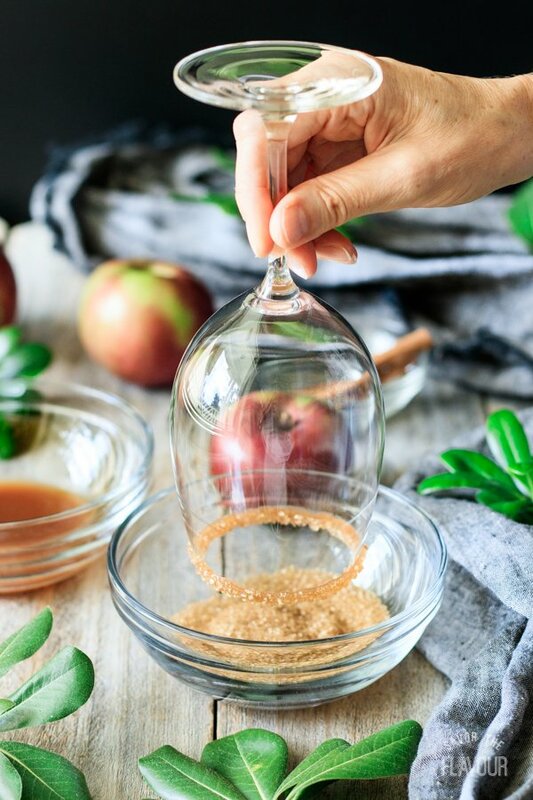 Pour the warm caramel sauce into the glass. Add the cold apple cider. Finish off with the sparkling ginger beer. Carefully stir until well combined with a long-handled spoon. Garnish with a cinnamon stick and serve immediately. Take the time to make the homemade caramel sauce. It has a rich, buttery flavor you just can’t get from store-bought caramel sauce. 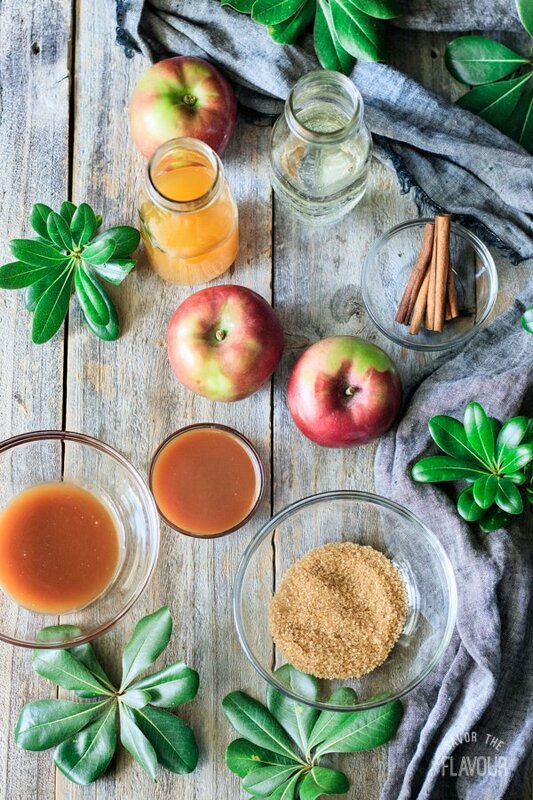 Keep the apple cider and ginger beer cold until you’re ready to mix the drink. Experiment with different rim flavors. Try two different kinds for a dinner party and see which one is more popular. Don’t substitute ginger ale for the ginger beer; its flavor isn’t strong enough. 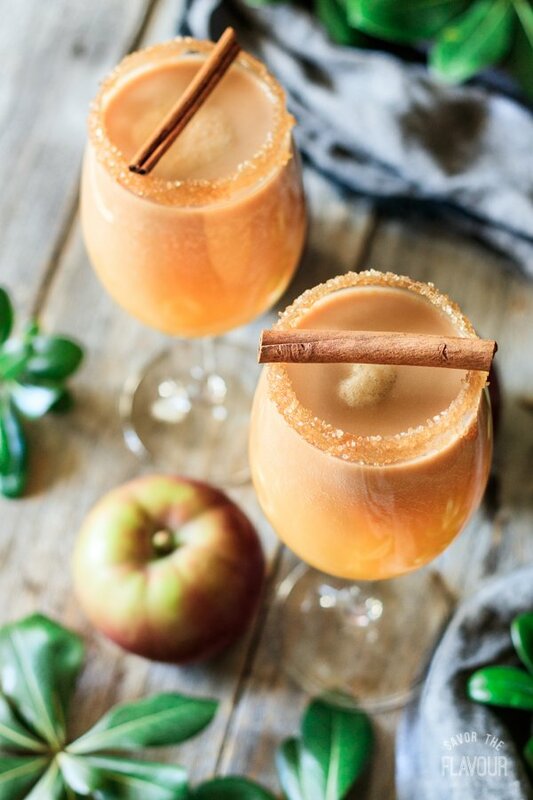 Ready to try a cold drink to celebrate the arrival of fall? I encourage you to make this sweet treat for your family tonight. 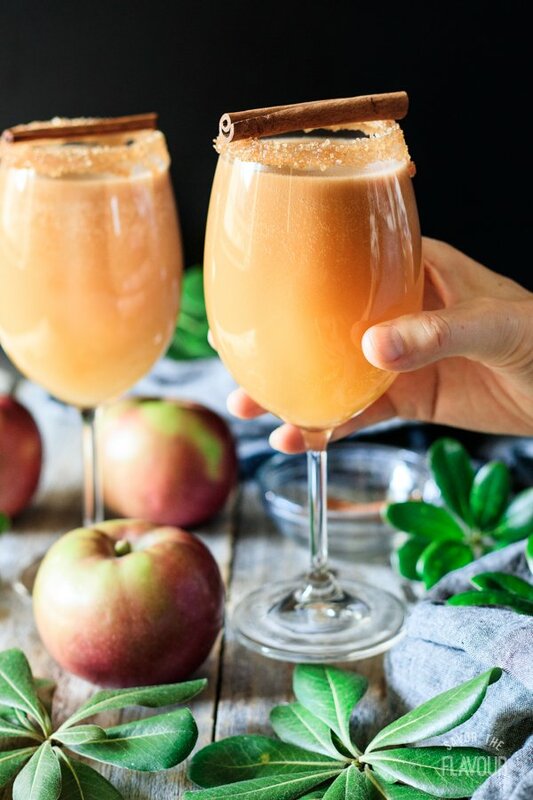 Have a taste of autumn with these other special drinks. 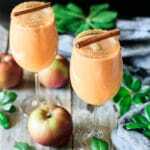 Mulled Apple Cider: this richly spiced drink is the perfect drink for Thanksgiving dinner. Salted Caramel Mocha: a special coffee drink with warm caramel and hints of chocolate. 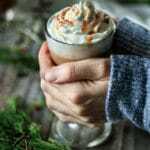 Pumpkin Spice Latte: learn how to make a Starbucks-quality latte at home with real food ingredients. 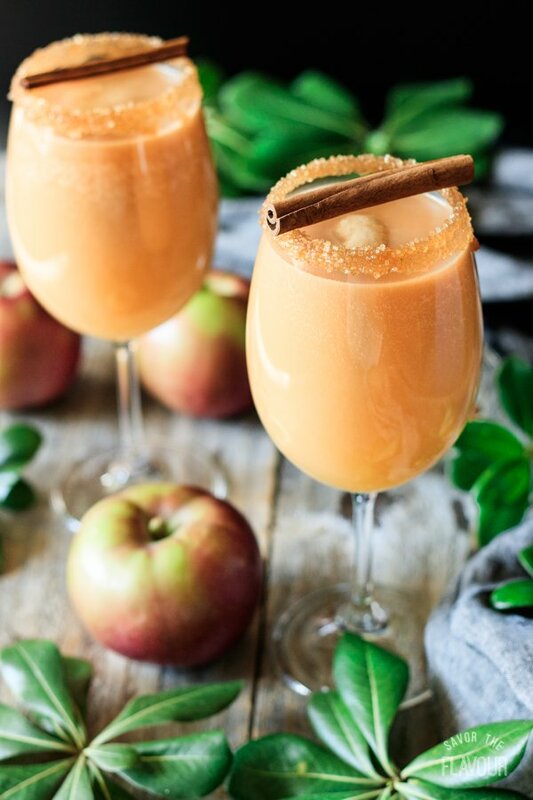 We’d love to hear your thoughts on this caramel apple mocktail! Drop a comment below to leave a recipe rating.